Industry Experts, Inc. released an updated 2018 version of its in depth comprehensive market report on Carbon Fibers. 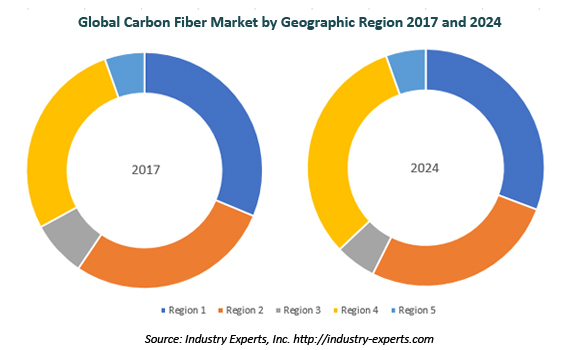 This global market report entitled “Carbon Fibers & Carbon Fiber Reinforced Plastics (CFRP) – A Global Market Overview” reveals that the Asian market for carbon fibers is expected to increase at a robust 2017-2024 CAGR in terms of both for volume consumption and the market value. The automotive industry is primed to be the fastest growing sector for carbon fibers and OEMs operating in this area are likely to employ a combination of steel, aluminum and composites based on demands of mechanical requirements and costs. The other sector likely to contribute to significant growth in demand for carbon fibers is pressure vessels that are used for storing and transporting compressed and liquefied natural gas in automotive and fleet applications, with regions in Asia-Pacific, South America and Europe being the main drivers. Application areas analyzed in the study include aerospace & defense, sporting goods & leisure, automotive, wind energy, pressure vessels, construction & infrastructure, molding compounds, oil & gas and other applications. Aerospace & Defense constitutes the largest end-use application for Carbon Fiber consumption globally, with a demand of 16.5 thousand metric tons in 2017, accounting for a share of 22.4%. The worldwide consumption of carbon fibers is estimated to reach 132.7 thousand metric tons in 2018. The study reviews, analyzes and projects the Carbon Fibers and Carbon Fiber Reinforced Plastics (CFRP) market for global and the regional markets including the North America, Europe, Japan, Asia and Rest of World for the period 2014-2024 in terms of volume (metric tons) as well as value (US$ million). These major regions further analyzed for individual markets in North America – the United States and Canada; Europe – Germany, France, Italy, Spain, Denmark and the United Kingdom; Japan; Asia excluding Japan – China, South Korea and India; Rest of World – Brazil, Russia and Turkey. This 466 page global carbon fibers and carbon fiber reinforced plastics (CFRP) market report includes 145 charts (includes a data table and graphical representation for each chart), supported with meaningful and easy to understand graphical presentation, of market numbers. The report profiles 50 key global players (carbon fiber producers – 15, carbon fiber recyclers – 3 and carbon fiber composite producers – 32) and 161 major players across North America – 50; Europe – 57; Japan – 14; Asia – 34; and Rest of World – 6. The study also provides the listing of the companies engaged in manufacturing and supply of carbon fibers and carbon fiber reinforced plastics as well as carbon fiber recyclers. The global list of companies covers the address, contact numbers and the website addresses of 331 companies.